As we finish with this year’s UCET Conference, I want to take a little bit of time to reflect on how the event went with a few of my favorite people, my #UTedChat family. I want to discuss some of the highlights as well as the lowlights because if we want to help the UCET Conference to continue to grow we need to be open and honest about how it went. And I realize not everyone who participates in #UTedChat tonight will have attended #UCET18 so please don’t let that keep you away. We will also be discussing the Value of having a #PLN, which I believe is CRUCIAL for any and all educators! Plus, even if you weren’t at #UCET18 you still may have some ideas that can help us make the UCET Conference the best education conference around! Please join me (@lars3eb) tonight at 9 pm MST as I lead the #UTedChat discussion on the topic of EduGoals for Finishing the Year Strong! I’d love to have you join the rest of the amazing #UTedChat community and share your awesome with us because we’re truly #BetterTogether. If you haven’t already followed me via Twitter (@lars3eb) feel free to do so because it may help you to better follow the chat. 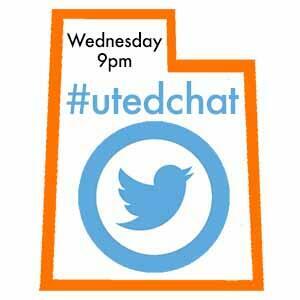 And as always, please be sure to include #UTedChat in your responses so everyone participating can see your thoughts and ideas. Q1: We live in an age where we can talk with each other over the Internet via Twitter, video calling, etc. Is it still even important to physically attend conferences? Q2: For those who were able to attend #UCET18, what was your favorite session? If you didn’t attend, where can you physically go to learn from others? Q3: We held a physical meet-up for #UTedChat while at #UCET18 & it was awesome to meet our #PLN IRL. Why is it important to build a #PLN and is it important to meet them #F2F? Q4: Conferences aren’t ALL rainbows & butterflies. What was one thing you’d like to change about #UCET18 or about your fav learning location? Q5: We had some AMAZING Keynotes at #UCET18 last week. If you could physically attend a talk/speech from anyone living today, who would it be & why? Q6 If you could add ANY fun activity to #UCET19 (because let’s face it, we’ll all be there) next year, what would it be & why? Derek Larson is a former classroom teacher and current EdTech Director at Southwest Educational Development Center, one of the four service centers working with the rural districts here in Utah. He loves working with teachers in the SEDC region, others throughout the state, and making connections all across the globe. He’s a proud Dixie State University and Southern Utah University grad. You can follow Derek via Twitter at @lars3eb. Back in December I posted some “Thoughts on Bored and Brilliant”. I’d like to invite you to participate in the week-long Bored and Brilliant Challenge beginning March 12. Each day I’ll post a link to the challenge for the following day. Take some time to listen to the podcast episode, check out the suggestions on the website and plan how you will step up. 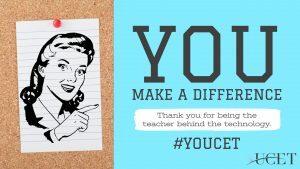 Let us know how you do with the hashtags #YOUcet, #ucet18 and #BABChallenge. Below is the schedule if you like to plan things out in advance. I’m looking forward to seeing how we grow. Hey! Remember playing Basketball Kahoot at UCET a couple of years ago? What about the year we had to find all the secrets hidden throughout the school, like the one on the back of Arnold Schwarzenegger? Well, we are playing Kahoot at UCET again this year! Don’t miss it! YOU Make a Difference! Thank you for being the teacher behind the technology. February 1st is fast approaching. That is the deadline for Early Bird Registration for UCET. Save yourself some $$$$. UCET is the largest Educational Technology Conference in Utah. We’ll meet at the University of Utah on Thursday and Friday, March 22nd and 23rd. Check out our website for more about our keynote speakers, Manoush Zomorodi & John Couch.